Introducing my research threads and professional development bursary, shadowing The Tetley as they commission new pieces of public art. ‘YOU ARE A ROCK’ is the first that caught my eye, unassuming it is engraved into a flag stone on the promenade outside the Leeds City Art Gallery. ‘GO THROW YOURSELF IN THE SEA’ is another which is situated on a public sign, the kind that might point you to the train station or public library. Not all the works are still in place, although a book featuring all the works was published. In Situations ‘New Rules for Public Art’ Rule no. 6 states ‘Believe in the quiet, unexpected encounter as much as the magic of the mass spectacle.’ and I feel that this is exactly what Mene Mene does. Many Leeds residents will have seen one or more of these texts and often wondered or been puzzled by them. I’m really drawn to the personal encounter of these works. 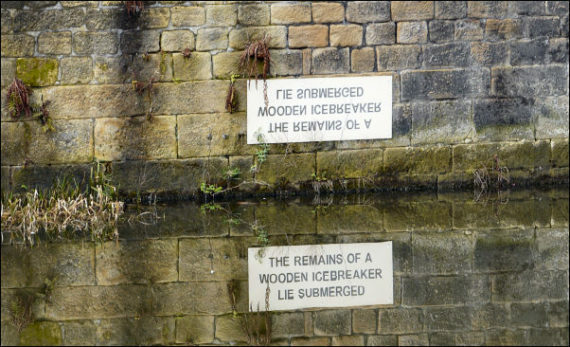 Similarly to this, on the Leeds & Liverpool Canal, I came across a reversed text sign stating ‘The Remains of a Wooden Icebreaker Lie Submerged’ this artwork can only be read through the reflection in the water. The sign refers to the landing stage marked by the sign at the site of Botany Bay in Armley. “Botany Bay received its name in 1808 as the landing place of the first shipment of Australian raw wool bound for Yorkshire mills. Submerged in Botany Bay are the remains of a wooden icebreaker. These heavy vessels were pulled onto the ice by teams of horses and rocked from side to side, causing the ice to fracture. Wooden icebreakers were sunk in the summer months in order to preserve their timbers” Along with the in situ signage, Palmer’s work also included a four-stage neon sign, and two accompanying photographs depicting the landing stage in different weather conditions. Read the full accompanying text to Palmer’s 2007 works here. There’s something special about these text based works, something mysterious and secretive. They make up part of the cities secrets, whereby the viewer must seek the answers, or be let in on the meaning by another person.